Maria and Stacy were very hospitable and helpful. Hotel was very clean. Location was very good to reach the wonderful beaches. Hotel is very good and Everything is well arranged. We stayed at studios. We found everything what we need at home basically. Thats why this is my second time in there. Personel was friendly and cheerfull al the time. Kampos beach is one of the best beaches in Samos with its sandy beach and crystal clear water. Clean. Spacious rooms and open areas. Well equipped kitchen.Very very kind staff. Proximity to bus stop. Lots of quality taverns and fish restaurants neatby. Ormos beach few steps away. 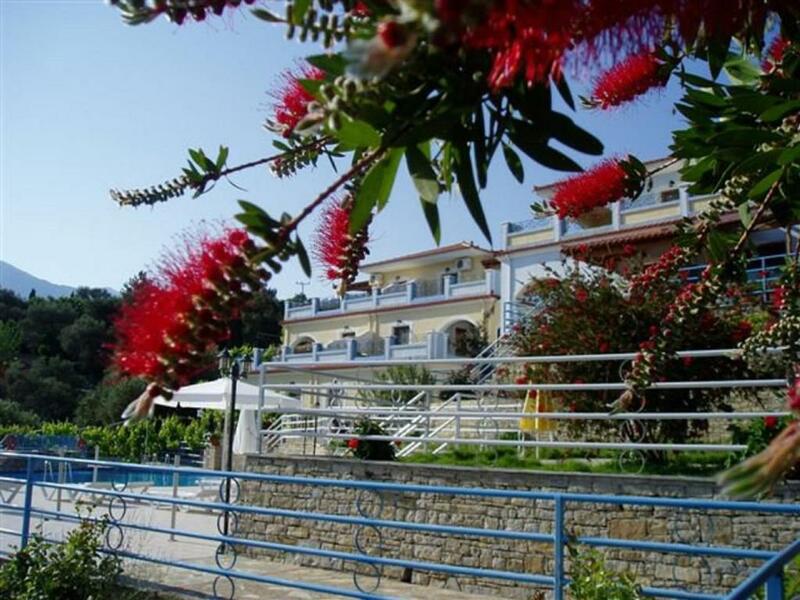 Pantheon is a beatiful hotel with trees, flowers in a well maintained garden. We stayed in a two rooms studio with a kitchen facility. We enjoyed having our breakfast in our garden which has a sitting group with a table. Beds are comfortable. The area is peaceful, we had a very good sleep at night. 2 min. walk to the restaurants, market and bakery. Short drive to the most beatiful beaches on the island. Most important is the people. The owner is Maria welcomed us with a huge hug. Sia is in the reception, she gave us useful informations not only for the hotel but the beaches, places around the hotel and some hints about the restaurants. Anna was very hepful and she kept our room and garden very clean. All in all we highly recommend Pantheon both for couples and families. Ormos is the perfect base to explore the island - a traditional fishing village with a small supermarket, two bakeries and a few nice tavernas. The hotel is only a short walk away from the port and all amenities. It is tastefully furnished and set over different levels with many plants which are labelled in both Greek and English! The pool is big and clean, and there are plenty of sunbeds and umbrellas. Very friendly and helpfull staff. Clean and perfect conditions. Very spacious apartment, large terrace, great view, kitchenware more than enough. Although the property is quite big you don't feel the neighbours. Almost everything was thought and prepared as a 4 star hotel although it's located in a summer vacation area. Helpfull and kind staff, clean, large and well decorated room, kitchen has sufficient tools. Ver nice restourants alongside the port. 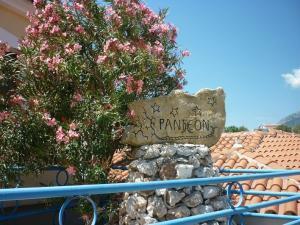 Lock in a great price for Pantheon – rated 9.3 by recent guests! Pantheon This rating is a reflection of how the property compares to the industry standard when it comes to price, facilities and services available. It's based on a self-evaluation by the property. Use this rating to help choose your stay! 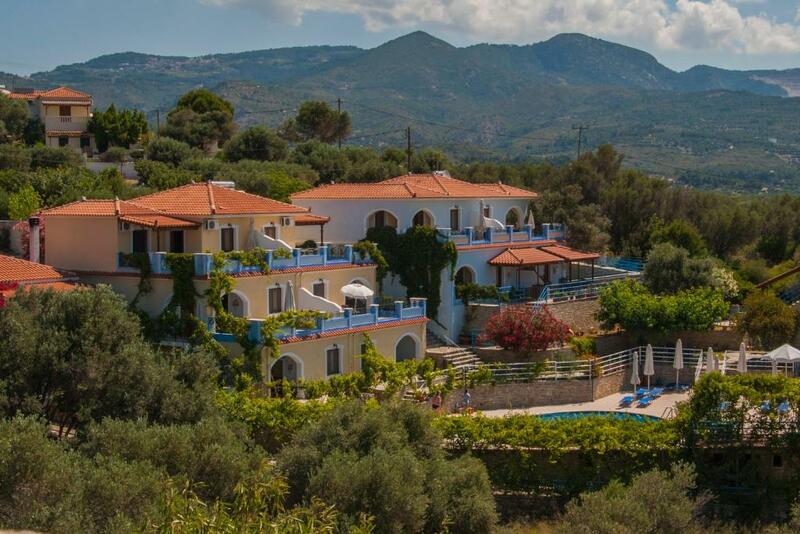 Located on a hillside, 800 feet from Ormos Beach, Pantheon offers self-catering apartments with Aegean Sea views. 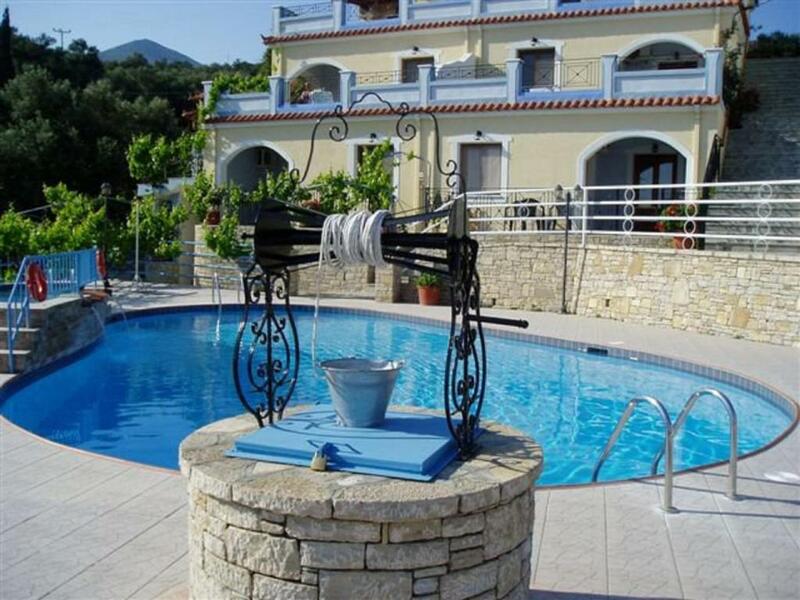 It has a pool and a children's pool, and it is within walking distance of the local taverns and cafes. Pantheon apartments come with traditional, wooden furnishings and a private balcony. Each consists of a separate bedroom and a living room with well-equipped kitchenette and dining area. The town and port of Karlovasi are 11 mi away from Pantheon. Samos Airport can be reached within 19 mi. WiFi access is available in all areas and on-site parking is provided free of charge. 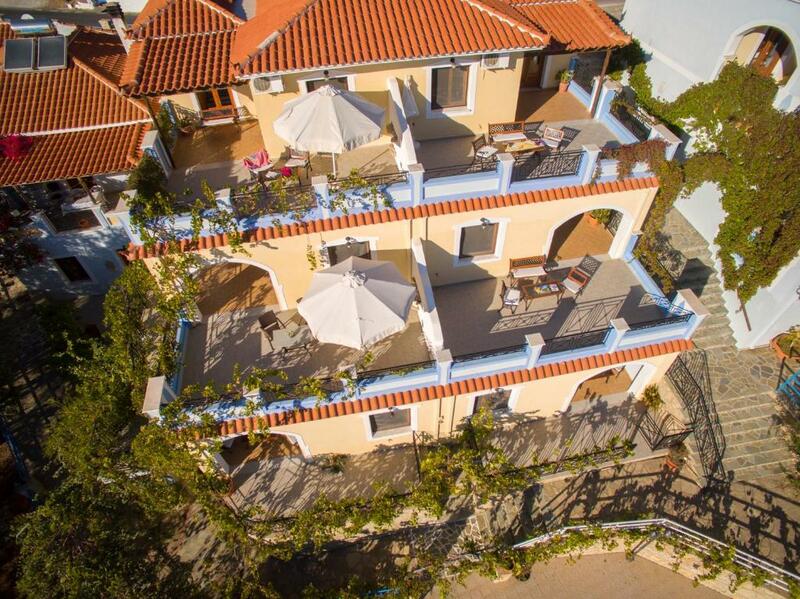 Offering sea, mountain and pool views from its furnished balcony, this air-conditioned apartment is fitted with traditional, wooden furniture. It consists of a separate, spacious bedroom, an open-plan and well-equipped kitchenette with dining area and living area with satellite TV. 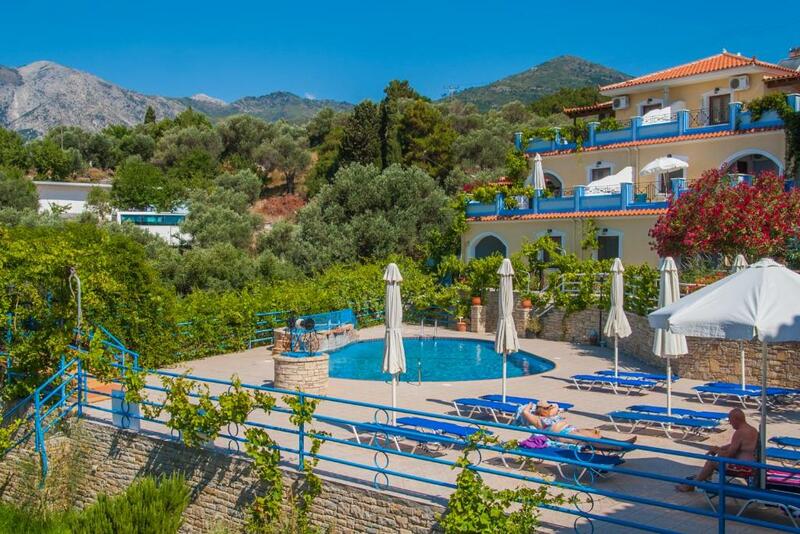 Overlooking the mountain Kerkis and the swimming pool from its balcony, this air-conditioned studio consists of a combined fully equipped kitchenette, bedroom and living area with flat-screen, satellite TV. The studio is privately located and has easy access to the pool. 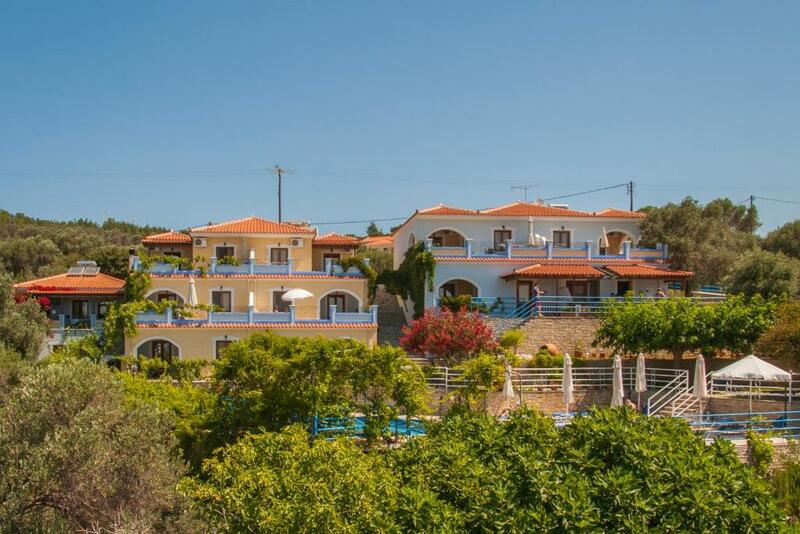 Overlooking the Aegean Sea from its balcony, this air-conditioned studio consists of a combined fully equipped kitchenette, bedroom and living area with flat-screen, satellite TV. The studio is privately located and has easy access to the pool. Offering pool view from its furnished balcony, this air-conditioned apartment is fitted with traditional, wooden furniture. It consists of a separate, spacious bedroom, an open-plan and well-equipped kitchenette with dining area and living area with satellite TV. 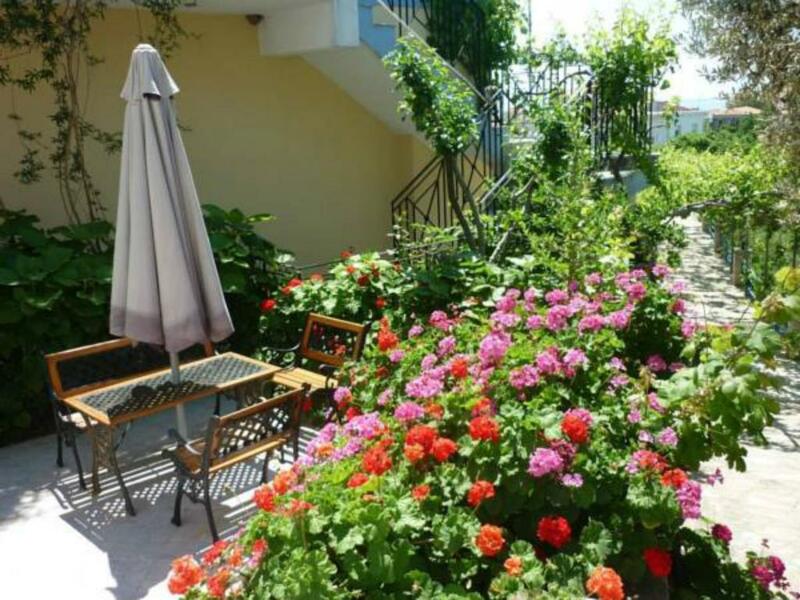 Offering mountain and garden views from its furnished patio, this air-conditioned apartment is fitted with traditional, wooden furniture. It consists of a separate, spacious bedroom, an open-plan and well-equipped kitchenette with dining area and living area with satellite TV. This is actually a building with serviced homes. No bar or cafe is available. However this is not a problem, because there are numerous eating out options few steps away. We are satisfied and have no complaints. Just one suggestion for improvement. The doors and windows are difficult to open and close. They need some grease. Nothing, only a car may be needed to get beaches and vicinty. Room was comfortable, clean and neat. All kitchen items was looking like new. You dont need to bring anything. Maria was friendly and helpful. Wifi is good in my room. Lots off space - lovly veranda to sit and watch the see. Very quietly location in a small local town with a few tavernas and a supermarket. 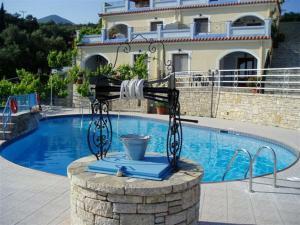 The property is a littel above see - but very easy and just a minute to walk to the sea and the tavernas. Lot of space around the nice and clean pool - and free sunbeds all the time we were there.